As commuters make their way from the Sierra Madre Villa Parking and Bus Facility at the terminus of the Metro Gold Line to Pasadena, they enter a steel mesh-enclosed pedestrian bridge with cool blue painted structural beams and posts. 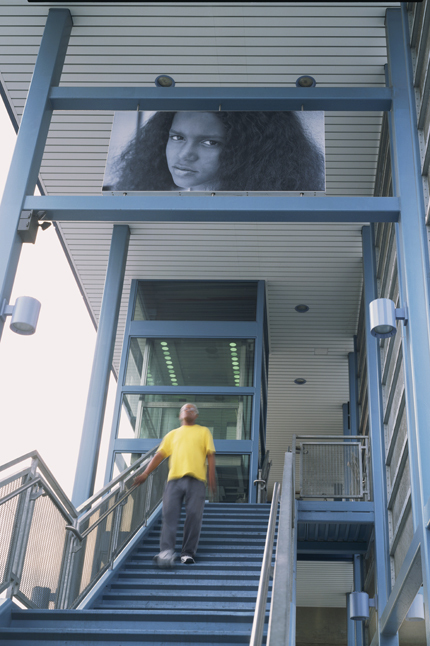 As they reach the end of this walkway and enter the station’s stairwells leading to the platform level, they are confronted by Tony Gleaton’s large photographic portraits suspended some 15-feet above them. Printed on two double-sided porcelain enamel steel panels and visible from both directions, the blue-toned portraits echo the blue enclosure of the bridge, and depict local inhabitants the artist describes as “the others.” These photographs reflect the distinct differences and diversity between us all, and mirror the connecting glance, embrace, and human emotion we share and understand together. TONY GLEATON has pursued an artistic career as a photographer since 1974. His interest in rodeo performers and black and Native American cowboys influenced a series of portraits of African-, Native-, Euro-, Mexican, and Mexican-American cowboys shot throughout Texas, Colorado, Nevada, Idaho, Kansas, and Colorado. His relationship with the Tarahumara Indians of Northern Mexico influenced a body of work shown in Mexico, Cuba, and the US by the Smithsonian Institution Traveling Exhibition Service. He is the recipient of a Durfee Foundation Award, and a grant from the Samoan Archives of the Oceanside Public Library to photograph present day American Samoa.